Alex J. Cavanaugh: A to Z Challenge – Dark Knight Rises and Dare You to Move, Plus A Change of Plans and IWSG Thanks! A to Z Challenge – Dark Knight Rises and Dare You to Move, Plus A Change of Plans and IWSG Thanks! Christopher Nolan infused these films with a sense that they could exist in our world. The movie captures the essence of the Dark Knight comics. Nolan is a director of such high caliber that he took a comic book character and elevated him into mainstream critical acclaim. John Blake is the young detective with a troubled past and desire for justice. He knows Batman’s secret and wants to help fight for the cause. His drive and ambition hint at the possibility he would take on the duties of Batman, maybe even as Robin. Nick Wilford at Scattergun Scribbles! His recent blogfest and book for his son, Andrew, probe he’s ready to fight the cause. Nick has a goal and a purpose, and he will make it happen no matter what. He still possesses that youthful idealism so necessary for achieving success. And he’s definitely a superhero. Nick is a writer and the editor of the anthology, Overcoming Adversity. Switchfoot’s seventh studio album won a Grammy in 2011 – name the album or the Grammy category. D’s trivia answer – Ernie Hudson also played a cop in The Cowboy Way and No Escape. I met Donna during the second A to Z Challenge and I could not be more happy for her! Once again, you guys amaze me! Special thanks to my co-hosts this month, Annalisa Crawford, Julie Luek, and Elsie. Between the Challenge and the IWSG, I was overwhelmed yesterday. My apologies to anyone I skipped or missed. I will be catching up this weekend on IWSG posts and on all of the awesome comments here. Big thanks to Damy and Carolyn for featuring my books yesterday, and to several others who mentioned them in their posts. Whoa! Next year, I’m taking the whole first week of April off from work so I can keep up! Fan of the Dark Knight movies? Fan of Nick? Know the trivia answer? Excited to pick up Donna’s book? 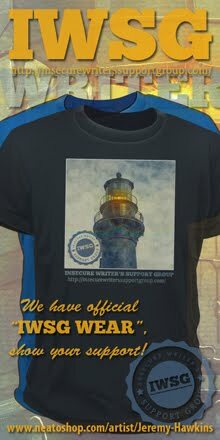 Did the IWSG rock this week or what? And anyone else feeling a bit overwhelmed…? Nick Wilford was a great choice! IWSG was awesome again as always! Now I know that doesn't count on the giveaway, but darn it, I tried! It was great to see Elsie hosting this. She's coming into her own as a writer now. Well, that would be Hello Hurricane, which I love! I do think that's probably their best, which is saying a lot. And, darn, I'm heading off to bed, but I want to put that on. The one Switchfoot album I own is the one with the song Dare You to Move. That one? I love everything that Nolan has done so far - he can do no wrong in my eyes, and TDKR is no exception. Oh man, I used to listen to Switchfoot a lot back in the day. I even met Jon Foreman once at the Creation festival. I haven't heard their stuff in years. Still good? I love The Dark Knight movies, but my personal favourite isn't the 2nd one, but the Batman Begins. Big fan of Nick and what he's doing for his son. A true superhero, indeed! Nolan really made TDK films awesome. Believable enough for 'mainstream', but true enough to the source for us geeks to really enjoy. I know what you mean...I'm feeling a bit overwhelmed too...and if I am, I can just imagine what you're going through. Hi Alex - Great film choice! I only 'met' nick a couple of weeks ago, but what a great guys - and your description is spot-on! Good choice Alex, it's very clever theme. Again a post full of news and views. I was late IWSG posting. My old girl (a 13 year-old pooch) was sick and had me worried. She's on the mend and almost back to her ornery self! And the change of plans thing made me nervous...glad it's just the reveal of an awesome story! I still haven't seen the Dark Knight movie, but will be on the lookout for it. Nick is a champion with a heart of gold: an excellent choice. Thanks for another successful IWSG Alex. Congrats to Donna! I'm not into comic book heroes, but Nick is try a special human being whoi respect tremendously. Yay, Donna! That cover rocks! And yes, I cannot keep up with everything I have to do & the A to Z makes it even harder. ISWG was just what I needed this month! I saw IWSG posts mentioning your books as well, nice of them. You identified Nick perfectly and the song choice is awesome. Pirates?! Yeah that could be shocking. Hi and congrats Donna! And I love this Batman movie series though the last one had a couple of bumps. I hope Nick's Overcoming Adversity Anthology does well and helps him to raise the money he needs to support his son Andrew! Alex, there was no need to thank me for including you and CassaFire yesterday for letter "C". It was a pleasure to read! You have a hat-trick today, picking one of may favorite movies, bloggers and songs. But where is the trivia question?!?!? LOL!! Wow! I'm humbled. Didn't see this coming. I'll take on being Robin - that's pretty cool! :D I'm not familiar with Switchfoot, I'll have to check them out. Thank you, cap'n!! Nick is an awesome choice to highlight a blogger. Love the mix on info on your posts Alex! Trying to visit blogs and return comments is really taking up a lot of time and pretty exhausting, and I only have a fraction of the comments you get. Have to pace myself. Yay for Nick! He's a great choice! I hadn't realized you were giving away a copy of your book. I've read the first & am waiting on some cash flow to get the other two. Really enjoyed it. Hey, my comment disappeared?! I just posted and it vanished. Nick is an awesome guy! Things are hectic---------- but I'm having a blast! Cynthia, sorry - that was an earlier album. Jamie, exactly how I feel. Sarah, I confess, I haven't either! Elise, thanks for listening! I need to mention the link goes to YouTube so people can hear the song choice. Carolyn, I really appreciated it. Nick, you are most welcome. Terri, maybe you'll win one. Thanks for helping with my cover reveal, Alex. I really enjoyed the first and the third Dark Night films. That second one was just ... disturbing. How could you NOT be overwhelmed with two blogfests?! 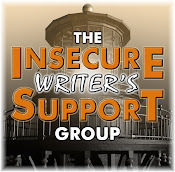 I couldn't get around to IWSG this month - let's say I'm not insecure (ha ha ha). I like most of the Bat Man movies, but I'm more excited about the new Star Trek. I don't know how you keep up on all the posts! Crazy! I'm taking off a day or two this month for the sole purpose of trying to catch up a bit for the challenge... I swear April showed up a few weeks early this year. Totally unprepared! Alex, how do you find the time! This is a truly heartwarming post (referring to Nick Wilford). It's a really awesome cause. The Dark Knight Rises is my second favorite Batman movie. My first is the original with Michael Keaton and Jack Nicholson. He made a truly credible Joker! I don't care about being the 1st or 100th comment, but wouldn't mind reading your book. I sign up on GoodReads also. Wonderful tribute to Nick! I couldn't think of a better song either. Dark Knight, not so much a fan. Oh Alex, I forgot. The best cure for being overwhelmed is action. Just sitting there and thinking about how overwhelmed you are makes the feeling worse. So get off your duff! Love the Dark Knight series for Christian Bale! And yes, I am feeling very overwhelmed right now. Nick Wilford is the perfect choice for Robin. Congrats, Nick! I love the Dark Knight movies and comics. Dare you to move has to be one of my favorite songs ever. Nick is a great pick for Robin. It's somehow comforting to know you get overwhelmed too, Alex. I still have not seen THE DARK KNIGHT RISES. I'll have to rectify that, and soon. I didn't get to any other group memebers' pages yesterday. :( Busy week. Nick definitely deserves a huge shout out. Congratulations to Donna. Susan, that was the second one. Thanks, JL! And I'm moving, I'm moving. great call on Darrin from Bewitched... I thought about "no escape"... i didn't think there were cops. that song was just a hair under 20 minutes and i had a instrumental of it to... it was a 40 minute joy. I've not seen Dark Knight, but my daughter watches frequently. I told her she's a thirty year old superhero in disquise. As usual IWSG was great. Combine it with the A to Z and it was over the top. Just purchased Nick's 'Anthology', but haven't had a chance to read it yet. On track for 'A Change of Plans'. Been driving 300 miles a day for the job, so it's been tough keeping up with all this blogging! But I've been "meeting" so many new people. Big fan of both Dark Knight and Nick. Nick is a great guy and very deserving of the spotlight. The anthology is awesome. I actually own a Dark Night movie - bought it by mistake from iTunes but watched and enjoyed it. I really enjoyed the Dark Knight movies. Nick is amazing. Hats off to him (if dragons wore hats, that is.) I was also surprised everyone I read yesterday tried to keep the IWSG posts short, that was very thoughtful. Still a lot of posts I missed. It has been a titan's job to keep up this three days -and I'm a dragon and dwarves are dangerous sprinters but not good for long runs. I hope I'll be able to pay back all visits now that Monday-Tuesday-Wednesday Tsunami has passed. Yeah, positive dragon! Positive dragon! I loved the Dark Knight Rises! A Change of Plans, this is the second post I've seen about it so I might just have to pick it up to see what all the buzz is about! Sorry I missed the IWSG yesterday. The Challenge and schoolwork totally overwhelmed me but I'm looking forward to a calmer month next month. I'll be back!! Great post and I love your theme! Nick sounds like a wonderful guy. I'll check out his blog. Thanks for introducing him to us! Love the Dark Knight movies! And Nick really is like John/Robin. Yes, must go see Donna-Congrats! I'm going to try the Batman movies again but I had trouble with Bale and a lot of trouble with the guy who played Joker. Just not my thing. Course, I grew up with Michael Keaton and I thought he was awesome. That book sounds good. I'm looking it up! Nick is an amazing Dark Knight. He has certainly risen to take of those who have no voice. I love this theme and it's one of my favorites. you've really outdone yourself this year, my Captain. D'oh! I just assumed we'd be skipping IWSG this month - sorry, sorry, sorry I missed it. Ironically, I'm listening to Switchfoot Dark Horses right now. I really enjoyed the movie, will be taking a look at Donna's book. Blessings for the week! Meant to write Robin (minus the Hood - different story) is the best super hero sidekick. Ack, I'm already bleary-eyed and it's only D Day! I'm a fan of the Dark Knight movies and a bigger of of Nick's. Great tribute to him! I'm feeling a little overwhelmed. I haven't managed to do any writing yet this week since I've been responding to comments. Odd, I'm currently listening to the soundtrack of THE DARK RISES. I loved the first two, hated the third. You have to pace yourself, Alex, or you'll burn yourself up! Nick is a great choice. He's amazing all around. Yes, I'm feeling a bit overwhelmed. Instead of counting sheep to sleep, I counted A to Z posts. I really need to see the Dark Knight Movies. I'm not a giant fan of the earlier Batman movies, but these seem more appealing. I like Ironman... and I can get along with X-men, but I am definitely picky on the comic iterations. Yesterday was my first IWSG. I loved it :) So encouraging. Oh, and Dare you to move is one of my favorite songs. I love how the Dark Night series of batman has this dark, morbid tone to it--less campy and more creepy. Ale, I can't read this blog any more! You make me want to quit writing and go watch a movie! Knowing how overwhelmed I'm feeling, I can't possibly imagine what you're going through! Eeek! Nick rocks, and I'm a huge fan of his heart-attitude for his family! Go Nick!!! IWSG seemed good, but I'll be making up a bit of visiting too . . .having fun on vacation does not equal time for visiting - only been to 15 blogs a day these days. I love John Blake and Nick is the perfect guy for that comparison. Big congrats to Donna for her cover reveal! Youthful idealism! I just wish I had some youthful energy. Overwhelmed is an understatement, Alex. I still have to squeeze a couple of family help-out trips into the month, the Northern Colorado Writers Conference, and a whole bunch of non-blog writing tasks. Still, I will carry on. It's what we do. Nick fits perfectly in the batman world, love it! And ya for Donna! Not sure how I missed her cover, but I LOVE it! Jeremy, Hudson was basically the enforcer of their law. And knew you'd like that one! Brandon and Bryan, not when Jethro Tull won the first Metal Grammy! Al, I think it will be easier from here on out. Nicki, the IWSG runs no matter the chaos. Hart, except you would enjoy it! Donna ROCKS. I've met her in person like four times??? She's so gorgeous and awesome. And I'm sooooo proud of her!!!! She's living the dream! The Dark Knight Rises is one of the best final films in a trilogy I've ever seen, up there with Return of the King and Return of the Jedi. And John Blake - LOVED him. I haven't seen any of the Dark Knight movies. I have a feeling I'm missing out. But I'm a huge fan of Nick! I admire him so much for his dedication to Andrew and his cause. I am feeling a bit overwhelmed with the A-Z already, but I'll just do what I can. I visited 50 blogs the first day - which is nothing compared to what you do daily, I know! Now I've got that song in my head. It plays during A Walk to Remember during the part I always bawl my eyes out. Dang that movie! Love Dark Night, Love Nick (and his theme this year totally rocks) And Joseph Gorden Levitt is a babe. Just sayin. I'd like to be able to say I can get on with a lot of writing in 'The Dark of the Knight' but that wouldn't be true ...or accurate! 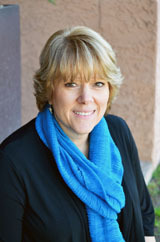 Saying hello to my blog 'master/coordinator'. I haven't heard that song, but I'll look it up on youtube. No idea about the grammy award though. Robin is my favourite Batman character! Have just recently had the pleasure of interacting with Nick. A superb choice by you, good sir. Plenty of links and all the best to those you have so kindly mentioned. Nick is a great choice. You keep picking the best. I think everyone is feeling a bit overwhelmed. As a person who is not used to posting daily, I know I am starting to feel the pangs already. I am sure others are, too. I am not sure it it will get easier or more difficult as April pushes forward. Damn, I'm the 101st commentor. That still counts for something, right? I got TDKR for x-mas and still haven't watched it. Don't have 3 hrs in a row to dedicate to watching it. I did see it in the theaters twice. Nick is so awesome! I hope he raises a lot of money for his son! Heath Ledger made the franchise for me. THE best Batman film IMHO! I think Nolan is a GENIUS!! I loved Inception and pretty much everything he's done. You picked the best Batman film. Your choices are perfect! I love Dark Knight; it was definitely the best ever Batman film. Wow, is Donna's cover outstanding or what! 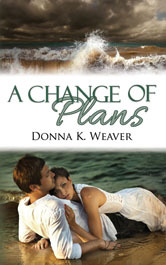 I'm a blog fan of Donna Weavers and look forward to seeing her book out! Your theme is great this year, Alex. I've really been enjoying the recaps of films I've seen and/or missed and the bloggers you've been highlighting. I'm so excited to take a look at Donna's book. Overwhelmed ...yes. I do not know how you do it. Could the Dark Knight trilogy be the most perfect trilogy ever made? TDKR was my favorite movie for 2012, and Dare You To Move is one of my favorite Christian Rock songs. Nolan's Dark Knight films are among my favorites, definitely. Batman is probably my favorite superhero, and I'm definitely a fan of Nick's. Congrats to Donna! I'm living under a rock. I'm not wild about Batman and never seen the movies. Only here for the trivia....Hello Hurricane was the Switchfoot title...and it was either contemporary christian or rock christian or something to that effect. IWSG was awesome! And yes, I loved the recent installment of Batman. Can't wait to see what happens next! I hate to admit it, but I haven't seen a Batman movie in ages. I liked them back in the day. Don't know why I stopped. I think Dark Knight was my favorite of the three. I used to listen to Switchfoot a lot. Some of their albums are perfect rainy day music. I knew Ernie Hudson for a non-cop role of his:, Winston Zeddemore the fourth addition to the Ghostbusters! Yes, you're right, "Dare You To Move" is a good theme. I love those batman movies. Gwen, we all need to play catch-up. Clarissa, the link leads to YouTube. Robin, easier - trust me. PTM, counts for warm fuzzy feeling. Optimistic, he is a genius. Maurice, second only to LOTR. Bish, crawl out from under that rock! I'd love to see what Nolan could do with Star Trek! Nolan is an amazing storyteller. The Batman trilogy stands alone, but Insomnia and Memento are also incredible movies...especially Memento. Nick! Awesome! I've yet to see DKR, but I've been wanting to for a while now! Loved Dark Knight Rises. And I hope they come out with another one. I love that song, Dare you to Move. It always makes me reassess when I hear it. Am I moving in the right direction? Great song! Nick is sooooo super cool. Hats off to him and I love the movie and song you chose for him. Very fitting. I love Donna. My old boss is her neighbor and I've had the chance to go to many events where Donna was in attendance. She is a sweetheart and her husband is a champ and a half. Congrats to the amazing Donna!!! Dare You to Move is one of my favorite songs of all time! :) And yay for Nick! That is actually one of my favorite Switchfoot songs. My other favorite would be "This is Your Life". I'm super busy - I didn't even get to the ISWG this month. Oops! The only daring I'm doing is to post more than I thought I could. Fantastic highlight. Christopher Nolan quits INTERSTELLAR and decides to do one more film on BATMAN. Nick Wilford is a wonderful choice. He is a true superhero. Me? Overwhelmed? Just 'cause there's so much good writing out there and new books to read and now there's an adventure romance with pirates? How very cool. Sorry if I'm not quite making sense. I'm kind of sleep deprived and trying to catch up on my blog reading. As always, Alex, you have so much good stuff. Thanks for always stopping by, Alex, and for co-organizing the A-Z! Enjoyed your post on the Dark Knight. I finally broke down and watched it with my daughter and was very impressed. It was a good movie. Before I read your post, I wasn't familiar with Nick or Switchfoot. Thanks for introducing me to them both. Hi Alex .. Nick Wilford dared and he will succeed I'm sure - Andrew deserves more education. Overcoming Adversity - opens up the doors to many a challenge .. I've seen the movie, I'm just not a big fan of the Dark Knight. Nice posting Congrats to Donna on her new book! Feeling a bit overwhelmed with projects and the to do list before my Dad comes to visit later this month. But, it'll all get done. And whatever doesn't, oh well. Dark Knight Rises was amazingly well done! It's by far my favorite Batman movie to date. Yay to Nick. His anthology is awesome! And The Dark Knight...what can I say? It was one of my top 10 movies!